It's officially December, which means it's time to make your lists and check them twice! No matter what your budget is, there always seems to be room for a few inexpensive presents. (Think stocking stuffers, Secret Santa exchanges, and coworkers.) These finds—all $10 or under—will gladden the heart of any stylish, beauty-loving girl without breaking the bank. Attach one as an add-on to a larger wrapped gift, or combine several items into a fun and eclectic present. I don't really get those knot elastics, but I do love that monogrammed mug! Totally didn't see it when we were at Park Royal this past weekend. 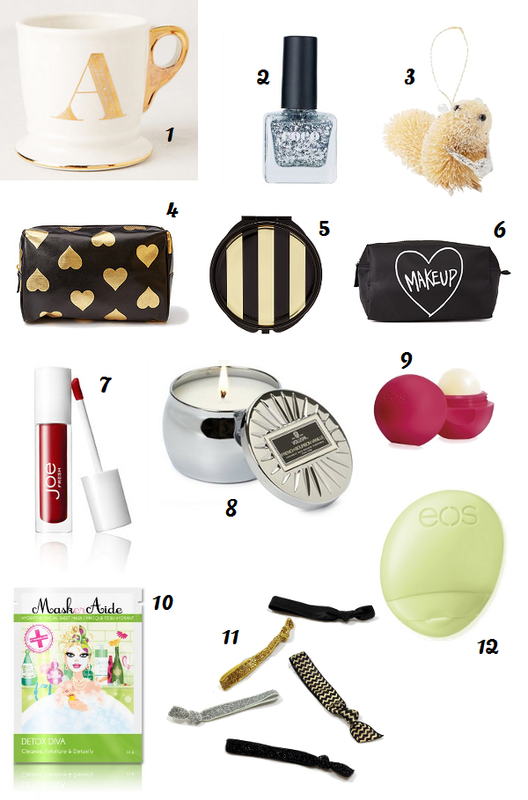 But then again there are a million trinkets in there :) And that striped compact mirror is too cute! Isn't the monogram mug pretty?! I have the normal one as a pen holder at home, but I'm tempted to get a gold version for work. great gift ideas. i love that these are at an affordable price point but still look lux and pretty. esp the cup and the candles. little things like that make my day. Thanks, Jenn! It was fun putting this guide together (and incredible to learn what cute things can be had for $10! ).